Judicial District Chief Judge James F. Hartmann Jr.
Sacramento County Sheriff Deputy disrespecting our laws and making fun of that fact in the process. While this might sound trivial or minor when those we trust to enforce our laws have no respect for them we have a huge problem. loss of reputation or respect, especially as the result of a dishonorable action. bring shame or discredit on (someone or something). In America today its obvious if you’re involved in law enforcement you can kill, steal, cheat and lie and you’ll most likely keep your job. We make excuses for the very people who should have the highest standards. This low life deputy who should never have been hired thinks its funny and in fact does feel above the law. She should be fired to set an example to all other officers, instead she’s promoting the bad behavior. This is another reason law enforcement does not like the idea of video evidence, it does not lie. We give the benefit of the doubt to police which they abuse and disrespect almost everyday. Some people don’t want to accept the fact that police who they expect to protect and serve are not living up to our expectations. 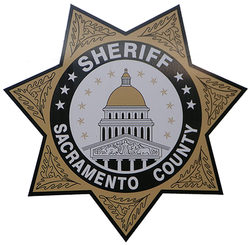 The Sacramento County Sheriff deputy, who was not immediately identified, has worked with the Sheriff’s Department for 27 years, 15 as a sworn officer. Violating the department’s codes of conduct – and the law – could get her fired, Undersheriff James Lewis said Wednesday. One of the scams used by management is to lie to the media getting them to think they’ll take harsh action against the violator, however behind the scenes nothing will be done, its usually all an act to quiet the community and interest. 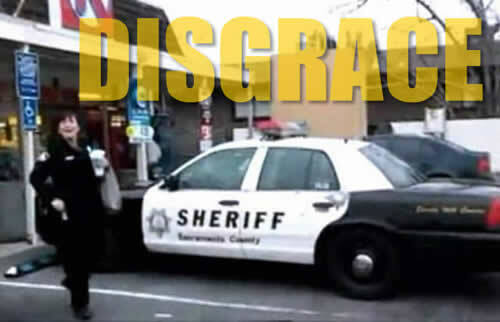 Lewis said he was “completely disappointed” when he saw the video, taken with a cellphone by a concerned citizen who watched as the deputy pulled into a disabled parking space, got out of her Sacramento County Sheriff department cruiser and walked into the store to buy snacks. She didn’t look like she was on a call, the man told Fox40. So, he started recording. The video, which Fox 40 brought to the attention of the Sacramento County Sheriff’s Department this week, focuses on a patrol car parked in a disabled space outside the Circle K on Hemlock Street near Auburn Boulevard. The Sacramento County Sheriff deputy can be seen smiling as she gets back behind the wheel, a plastic bag slung over her arm and a drink container in her hand. “You always park in handicap when you’re not on a call?” the man asked. Why is Santa Clara County Hiding Death and Crime? UglyJudge.com Proudly Hosted by Evolve Hosting. UGLYJUDGE Copyright 2006-2019 Evolve Hosting All Rights Reserved.